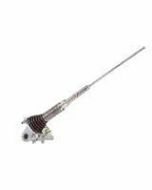 ICOM Antenna Tuner Control Cables OPC-136, Four Conductor, 16.4 ft.
Icom 703, 703+, 706 MkIIG, 718, 746, 746Pro, 756, 756Pro, 756ProII, 756ProIII, 7000, 7100, 7200, 7300, 7410, 7600, 7800, 9100. 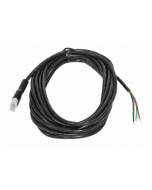 The AH-4 provides reliable matching of frequencies from 3.5 MHz to 54 MHz when using at least a 7 m (23 ft) antenna; or 7 MHz to 54 MHz when using the AH-2b ANTENNA ELEMENT. The built-in 8-bit microprocessor chooses the lowest SWR condition from more than 1,040,000 different LC (coil/capacitor) combinations. The LC combinations of 45 previously-used frequencies are automatically memorized in the AH-4. Once a frequency is memorized, the AH-4 tunes on that frequency in less than 1 sec. Note that the AH-4 does not memorize a frequency which is normally tuned within 2.5 sec. Memories are retained only when the power is on. The AH-4’s tightly sealed plastic case allows convenient mounting virtually anywhere. The AH-4 can be mounted outdoors under your antenna. Radiated power during tuning is less than 0.3 W, minimizing interference to other stations. NOTE: 50 MHz tuning is possible with the IC-729*, IC-706MKII, IC-746 and IC-756; the IC-706 and IC-736 can only be tuned 3.5–30 MHz. * Connect a 50 MHz antenna connector for 50 MHz operation.